The cassava CARP mobile application showing features and services it offers. 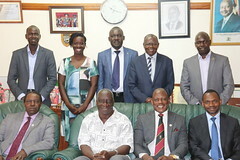 3Uganda Technology and Management University (UTAMU). Several households in eastern and northern Uganda depend on cassava as their sole starch staple food and source of income. In the 1990s, cassava production was threatened by the emergency of the Cassava Mosaic Disease (CMD) which led to high incidences of hunger in the regions and loss of household income. To address the challenges posed by the CMD, the government of Uganda through the National Agriculture Research Organization (NARO) introduced and promoted CMD resistant varieties to replace the once popular landraces to avert food insecurity. However, the newly adopted varieties were in the 2010s devastated by emergency of an even more devastating disease, Cassava Brown Streak Disease (CBSD). Up to date, resistant varieties to CBSD have not been developed. The rapid spread of the cassava viral diseases is largely attributed to the poor monitoring and tracking of the cassava planting material production, certification and distribution processes. The strategy of ensuring continued availability of clean cassava planting materials for farmers has largely focused on promoting the use of clean planting materials which are virus indexed, produced in tissue culture laboratory, and multiplied in screen houses as basic seed. Such basic seed stock is later multiplied in “mother gardens” prior to distribution to farmers as seed. The multiplication of planting materials in the screen houses avoids re-infection at early stage that could be mediated by the virus vectors like the whiteflies. Therefore, to control the spread of cassava virus diseases through planting material, the government of Uganda through the Ministry of Agriculture Animal Industry and Fisheries (MAAIF) certifies mother gardens of all multipliers in the country. The certification process records are largely manually generated and stored. Farmers have limited means of verifying if indeed, the cassava planting materials they receive from suppliers are certified. They cannot trace the origin (source garden) of the cassava planting material in the current model of planting material distribution. During the implementation of the Makerere University Cassava Community Action Research Project (Cassava CARP, RU 2014 CARP 04) it emerged that about 90% of cassava gardens in eastern Uganda which planted cassava materials supplied by various sources had high incidences of CBSD and CMD outbreak while those supplied by the Cassava CARP through community mother gardens, had no disease incidents. The high incidents of disease outbreaks inspired the Cassava CARP team to investigate the causes. It was revealed during the engagement with farmers and planting material suppliers, that there is a challenge of monitoring seed multiplication and documenting seed quality. It was also observed that the cassava cuttings supplied by “certified suppliers” were not well prepared and a significant number of them had damaged nodes – and therefore poor germination. Furthermore, there was significant mixing of varieties in the delivery bags, indicating poor packaging and distribution process management. Due to the high demand for cassava planting materials in the communities (e.g., a bag of cassava planting material of a popular cassava variety goes for 75,000 UGX (≈USD 20) in Serere district), some of the certified suppliers sometimes integrate cuttings from non-certified out growers which compromises the quality of seed. We note that, the current system of cassava planting material production and distribution lacks mechanism of monitoring, tracking and verifying planting material mother gardens profile in terms of pest and disease prevalence among others. Therefore, the inability to verify planting material sources and track their distribution among farmers creates a big challenge of containing the spread of diseases as witnessed in by the Cassava CARP study districts of northern and eastern Uganda. The manual system of documenting cassava planting material certification and distribution has resulted into supply of unclean cassava planting materials to farmers. This has led to the re-emergency of the cassava virus diseases in northern and eastern Uganda. The re-emergency of CBSD is threatening the loss of the popular cassava crop varieties, which might result into food insecurity and loss of household income. Furthermore, the re-emergency of CBSD increases the pressure on the National Agricultural Research Organization (NARO) and partners to invest in the development of new cassava varieties each time the existing ones get infected. As a means of addressing the challenges associated with clean planting material production, certification and distribution monitoring, the Cassava CARP team developed an ICT enabled model of tracking cassava seed inspection, certification and distribution. The model is implemented in a mobile and web cloud based applications. The frontlines services of the model are accessed via the mobile phone. The services provided include: farmer profiling, garden profiling, cassava garden inspection and certification management, GIS mapping services, management of planting material delivery processes (like tracking origin of materials, date of dispatch and receipt, supplier certification identification, harvest dates. The applications enable farmers to access source garden inspection reports and verify authenticity of the material source and supplier. The application enables farmers who receive materials to submit reports on the status of the material received. This information can be made available to the inspectors and certifying agency. The applications are able to visualize levels of complaints or compliments on the material received and the associated suppliers. This information is vital in curtailing the supply of poor quality material which often results into spread of cassava virus diseases. The use of the Cassava CARP mobile and web applications have helped farmers to identify good and bad cassava planting material suppliers. The applications have improved cassava multiplication garden information management, including garden history and inspection profiles. The applications currently serve many famers in the 4 districts of the project area of Apac, Bukedea, Kole and Serere. The famers in each district are in 6 clusters each with about 25-30 farmers. The use of the applications have enabled the initiation of community based extension system around the cassava value chain as farmers learn to consultant each other and share experiences via the platform. A policy on ICT integration in seed production monitoring and distribution tracking and the broader extension service: MAAIF needs to develop a policy and associated guidelines on how to integrate ICTs in monitoring seed production and distribution. The policy should enforce the need to have all seed multiplication gardens mapped using geo-coordinates, garden inspection report aggregated on mobile and web systems. The policy should prescribe the intended services to be delivered to stakeholder such as farmers, the technology platforms upon which engagement is to be conducted, models of staff performance monitoring and reward, profile of stakeholders to be engaged and measure of successful engagement. Appropriate ICT infrastructure: The success of the Cassava CARP has largely been due to appropriate investment in ICT infrastructure to support community engagement ubiquitously. The project deploys tools and platforms which provide self-service on the concept of anywhere, anytime and at the wish of the stakeholders. The project uses open source technologies and standards that lower total cost of technology ownership and have a wider user support base. Therefore, it is important for MAAIF and seed distribution programmes to invest in appropriate technology platforms, not only to track seed production and distribution but also to monitor extension agents’ service delivery to farmers. The use of location based services and geo-spatial data mapping can improve the transparence of service delivery to farmers by extension agents. Establishment of collaboration and partnerships: Successful implementation of ICT mediated community engagement tools largely depends on existence of effective collaboration among stakeholders. Stakeholders need to establish effective collaboration networks with actors in the communities to provide feedback using ICT tools on service delivery. The community engagement and action research activities were supported by the Regional Universities Forum for Capacity Building in Agriculture (RUFORUM). The Cassava CARP, acknowledges the support and mentoring in aspects of community engagement from RUFORUM and Makerere University. For more information, visit http://www.cassava-carp.org/. Drake Mirembe holds a PhD in information systems security from Groningen University, Masters in Computer System Security from Radboud University Netherlands, and BSc Computer Science and Math from Makerere University. He works with Makerere University as a Lecturer in the Department of Networks. He is a collaborating researcher on the Cassava CARP. His research interests include ICT for development, cyber security and innovation management, mobile and wireless technologies. More detail on www.drakemirembe.org. Dr. Settumba Mukasa is an Associate Professor of Crop Science at the School of Agricultural Sciences, Makerere University. He is the Principal Investigator of the Cassava CARP that works in the cassava growing communities of northern and eastern Uganda districts of Apac and Kole, and Bukedea and Serere. He has led several plant biotechnology research projects at national and regional levels – with special attention interest in vegetatively propagated crops like bananas, cassava and sweetpotato. Dr. Jude Lubega is a Professor of Computer Science in the School of Computing and Engineering at Uganda Technology and Management University (UTAMU). Dr. Lubega is a thought after expert in the areas of E-Learning and ICT for development and has published widely on the subjects. He acts as an advisor on the ICT component for the Cassava CARP. ← Call for rural youth Agribusiness Entrepreneurs support.